This article first published in May 2013 documents France’s role in supporting terrorist formations in Syria. The UK Foreign secretary William Hague, and his French counterpart Lauren Fabius, are leading an isolated charge within the EU to lift a supposed arms embargo to self-described ‘rebels’, hitherto destroying Syria for over two years. Several underlying factors need to be addressed before these diplomatic (some would say military) manoeuvres are put into context. Acting under the auspices, or “consultation” of Western intelligence services, Qatar, Saudi Arabia, Turkey, and non-state actors sending thousands of tonnes of arms and funds to extremist militants in Syria; is directly synonymous with both a huge increase in casualty numbers and civilian displacement; and the huge rise and proliferation of extremist militants operating in Syria. This highlights, as previous conflicts in the region have shown; that further Western military intervention is not about to bring peace and harmony to a nation already engulfed in the throes of war (much of which western powers promoted and enabled). But peace and harmony are not on either France, nor the UK’s list of priorities in the region; removing President Assad and weakening the state of Syria, Iran’s staunch ally, most certainly are. It seems the less Imperial-minded states of the EU, and indeed, those less attached to US militarism and designs for the Middle East, were incensed by Hague and Fabius’ stubborn attempts to stifle the popular opinion within the EU that sending yet more military equipment to a disparate melee of extremist rebels may be of dire consequence. Hague, with his vast intellect, failed to acknowledge this most obvious of pitfalls, and seems more eager than war-mongerer/profiteer US Senator John McCain is to feed into the western public the idea that ‘moderate’, or ‘secular’ minded ‘rebels’ in Syria actually exist. To quote an equally moral and intelligent Western statesman, the UK is acting on the policy of “unknown unknowns”. Hague et al claim to know of ‘moderate’ and ‘secular’ fighting forces wishing to take up arms against the Syrian Government; yet literally no one in Syria or analysing the conflict from afar is able to find them. 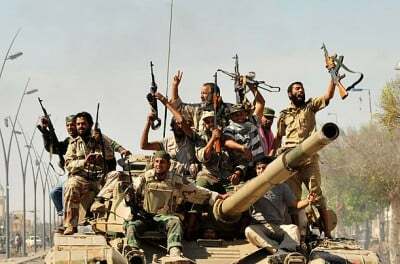 As the weapons flow increased and the funds from Gulf donors magnified, it has been the most extreme sectarian elements of militia that have been bolstered by such support, and indeed, further encouraged by Western diplomatic cover and the dutiful Western mainstream media’s glowing appraisals of freedom fighters and ‘rebel’ propaganda. This has only enabled the Jihaddi/Salafist elements hell-bent on sectarian violence and destruction to gain in recruits and popularity. As in Central America, Afghanistan, Libya, Serbia, Kosovo, etc: these extremist elements form the ‘Shock Troops’ of a Western designed subversion model; used to great effect by Western powers to enable the social and structural destruction of a nation “outside the West’s sphere of influence”, in order to bring about regime change. This “bombing back to the stone age” is what Imperialist apologists might term: holding down the competition. As previously noted by many a statesman and scholar, the last thing any Western government desires is the self-determination and independence of resource-rich, strategically placed nations. “[it is] important for Europe to send a clear signal to the Assad regime that it has to negotiate seriously, and that all options remain on the table if it refuses to do so”. One thing is certain, Hague does not speak for Europe. 25 of the 27 European nations were against the lifting of the embargo. The French and British refusal to accept the popular consensus meant that no decision or required extension of the current embargo could be made, resulting in its expiration. This in turn allows EU states to act as they please, as Hague said himself, this was the exact outcome the UK was hoping for. Once more, Hague is speaking with no authority, only 16% of the UK population agree to sending arms to ‘rebels’ in Syria: UK democracy in action. The desired outcome of the lifting of the EU embargo will be increased military support to what the CIA, and NATO aligned governments describe as “vetted moderate” rebel forces. Which for all intents and purposes, simply don’t exist. The more likely outcome will be to create further reluctance of the Syrian ‘opposition’ elements within the SNC to negotiate with the Assad Government; further encouraging them and the extremist elements on the ground in Syria to continue their futile quest for a military solution. This policy will embolden extremist rebels fighting the Syrian Army in the hope they are to receive further Western support, with the ultimate desire of Western intervention just around the corner. As Hague warns of “conflict spread”, which is evidently already occurring in Northern Lebanon, and inextricably linked to increased sectarian strife in Iraq; his Orwellian mindset seems unable to realise that adding more arms to this conflict ridden region will result in anything other than further destabilization. Surely Western powers cannot uphold this pretence any longer, it is glaringly obvious to many that Western involvement and “concern” over Syria has nothing to do with the civilian population and everything to do with regime change by all means necessary, including the tacit arming, funding and diplomatic support of extremist Al Qaeda affiliated ‘rebels’. Furthermore, while the UK was desperate to lift the arms embargo on Syrian ‘rebels’. It was at the forefront of attempts to uphold the crippling economic sanctions put in place against the Syrian Government. These sanctions, as applied to devastating effect many times before, are again, solely designed to punish the civilian population in attempts to create civil unrest and discord against the Syrian government to bring about regime change, a wholly illegal act in itself. Hague, in another world-class show of diplomatic cognitive dissonance, candidly admitted the failure of these sanctions as a reason to lift the arms embargo, stating: “The EU arms embargo must be lifted because the current economic sanctions regime is ineffective.” If the economic sanctions aren’t working, yet evidently punishing the civilian population, why is the EU keeping them in place? Simply as a tool to further pressurize the Syrian Government and push the civilian population into chaos, poverty and revolt. Whilst the UK government declares a “battle against terrorism” on its own soil, its Foreign Policy willfully follows the Western trend of fomenting, arming and supporting the very same ideologues abroad. All to suit the pernicious Western establishment agenda of economic and military dominance throughout the Greater Middle East and beyond.